Action from Peterborough Sports (blue) v Sutton Coldfield last weekend. Photo: James Richardson. Peterborough Sports are within touching distance of a third title in four seasons and manager Jimmy Dean is finally getting excited at the prospect. Sports need a maximum of six points from four games against teams in the bottom half of Division One Central of the Evo Stik Southern League to clinch top spot. Last weekend’s 3-0 home win over a stubborn Sutton Coldfield side coupled with a shock home draw for sole title rivals Bromsgrove Sporting moved the prize much closer. They will seize the crown tomorrow (April 13) if they beat Aylesbury United (3pm kick off) and Bromsgrove lose their awkward fixture at Cambridge City. “I’m getting excited now,” Dean admitted. “I’ve been playing down our chances all season because of the size and quality of some of the other clubs in the league, but it’s getting close now. “We won’t be changing anything. We will still work hard in training and we won’t be taking any team lightly, but I’d be disappointed if we didn’t win it from here. Dean has a centre-back riddle to solve this weekend as Stuart Wall dislocated his kneecap against Sutton Coldfield after coming on a substitute for hamstring-injury victim Richard Jones. 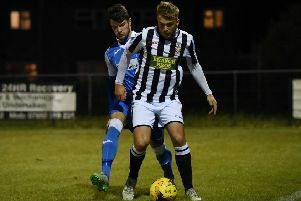 Former Posh youth team player Sam Gaughran could be asked to step in against an Aylesbury side Sports beat 4-0 away from home earlier this season. Yaxley are already celebrating after sealing survival from Division One Central with a 2-0 win over Coleshill at the Decker Bus Stadium last weekend. Yaxley travel to Dunstable Town tomorrow. The relegation battle in the Senior East Division of the Northern League sees Wisbech Town travel to Lincoln United and Spalding take on Loughborough Dynamo at home. Peterborough Northern Star’s recent improvement in the United Counties Premier Division - they’ve won their last two matches - will be tested at runaway leaders Daventry. Second-placed Deeping host Harborough Town. East Division: Lincoln Utd v Wisbech Town, Spalding Utd v Loughborough Dynamo, Stamford v Belper Town. Division One Central: Dunstable Town v Yaxley, Peterborough Sports v Aylesbury Utd. Premier Division: Daventry Town v Peterborough Northern Star, Deeping Rangers v Harborough Town, Holbeach United v Rugby Town, Leicester Nirvana v Pinchbeck United. Division One: Burton Park Wanderers v Bourne Town, Huntingdon Town v Lutterworth Athletic, Raunds Town v Blackstones. Division One North: March Town United v AFC Sudbury Res, Needham Market Res v Wisbech St Mary.